Quick Cleans or Complete Details? If you are a savvy customer, you are always looking for ways to have the best possible experience for least amount of your time and money. 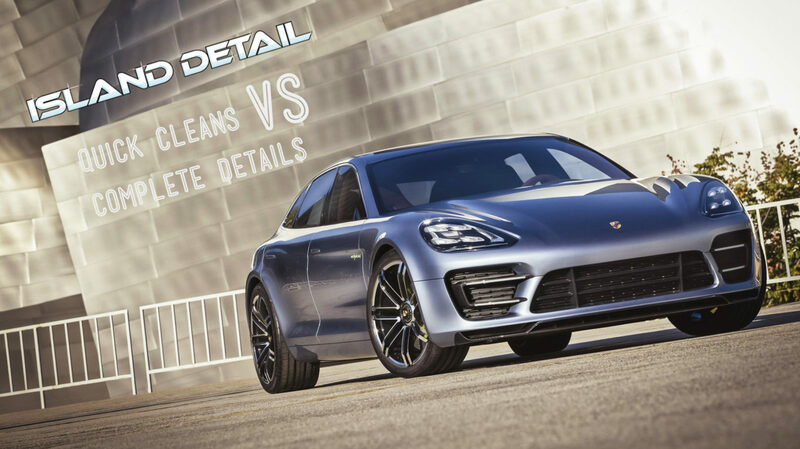 In this blog post we are going to show you the two different ways that our customers try to achieve detailing nirvana, with our pick for which option is the best way to use your money. The Complete Detail is one of our flagship services. It is an inch by inch detailing of your entire vehicle, inside and out. It usually takes an entire day, and when customers see their vehicle get transformed back into the sparkling specimen it was when they first purchased it they are always blown away. The question is: is this the best way to spend your detailing budget? The reason why customers are usually so happy with the transformation is because they have completely let their vehicle go, cosmetically speaking. The carpets and upholstery will be in really rough shape, it has not been washed or waxed all year, pet hair is building up, and the console, buttons, and switches are completely gummed up. When we give a complete refurbishment, it is a stunning rejuvenation and the reveal is dramatic. Total Cost: This costs the customer $265 (or 325 for a Truck or SUV). This is a steal considering it takes our team an entire 8 hours to complete the job, but the question remains, is there a better way? The second option is one that takes only about 30 minutes, requires no appointment, and allows our clients an absolutely perfect vehicle ALL THE TIME. The way to do this, is to come in once a month for a Quick Clean. The Quick Clean is our most popular package. It includes a wash, rim & tire cleaning, interior vacuum, centre console cleaning, and window washing inside & out. This covers all of the most highly trafficked areas of the vehicle and guarantees that your vehicle always feels like it has just been detailed. In Option 1 above, those clients are letting their vehicle become such a mess that they are pretty much forced into paying a huge sum to have it detailed and have the hassle of being without a car for a day. Using monthly Quick Cleans instead, our clients enjoy a perfectly clean car all of the time, and they never need to go to the expense of a full detail. So, what does it cost to have your car cleaned every month instead? It turns out this is a complete no brainer. By getting monthly Quick Cleans can have a clean car all the time AND you will save $50 a year (and you would never be without your car for a whole day during detailing). Comparing that to letting your vehicle become a mess and then overpaying for complete details makes it an obvious choice. We would love to see our clients save some cash and have the joy of a really clean car on a regular basis. Give us a shout and you can come by for a quick cleaning, you will be very glad you did.